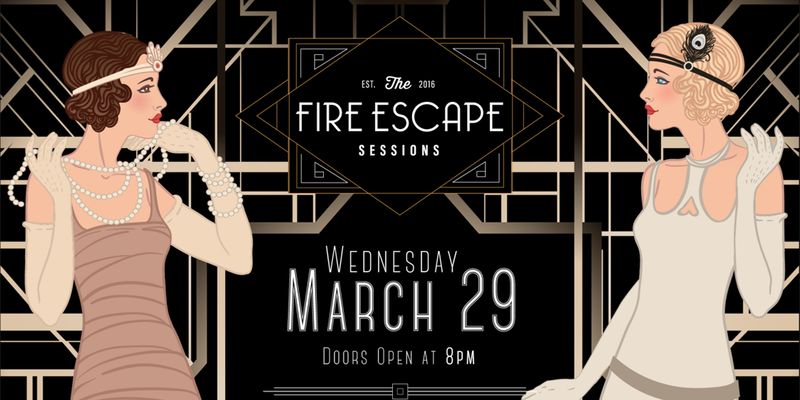 Tonight, Wednesday, March 29, the third edition of the Fire Escape Sessions, will be at Lola’s, the upstairs bar and entertainment space above Butchertown Grocery at 1076 E. Washington St. The show will feature singer/songwriter Justin Paul Lewis and the Quiet Hollers, performing all new songs off their next album. Hosts of the show is the team of Thirty Spokes front-man, Chad Graham and professional actress, Carrie Cooke Ketterman. Event organizer Alec Betz strives to “replicate what a show would have been like at one of Al Capone’s nightclubs, but updated with modern music and comedy,” according to a press release. Rabbit Hole Distilling is partnering with Belz for the series which is also a video podcast recorded in front of a live audience. Other sponsors include The Nitty Gritty, LP Productions, and Discount Smokes. The podcast will be available for download on Facebook, Vimeo, and YouTube. The doors open at 8:00 pm, with the show beginning at 9:00 pm. Admission is $10 and tickets are available online at EventBrite or at the door.